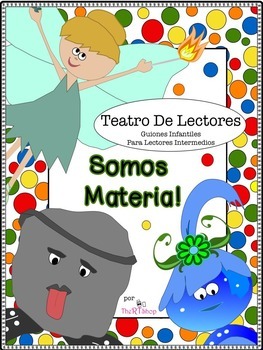 Science And Reading Integration: "Somos Materia"
This Reader’s Theater Package is a great resource to use in your classroom in many ways: Reading, Writing and/or Science Centers, small group activities, partner’s activities, or teacher table. To include more of the Speaking and Listening Standards, have the students work in partners or small groups to discuss verbally the answers to the questions. Also have them do the activities together so that they can share ideas before writing them down. 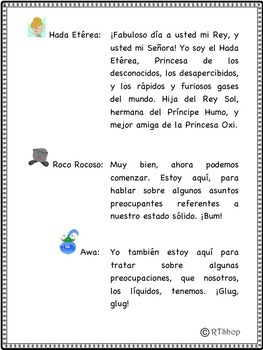 Reader’s Theater is one of the best tools in the classroom to have students gain fluency, accuracy and comprehension in reading. It also reinforces listening skills, and teamwork. This is a fun little script, in which the students will learn a lot about the states of matter, while learning new Science vocabulary and getting their reading fluency practice! 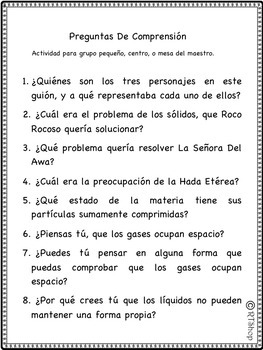 I’m including comprehension question to check on understanding, and I’m providing some answering sheets with sentence stems for the students to answer the questions in complete sentences. 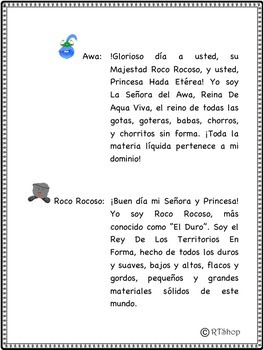 I’m a bilingual teacher so all my plays will be written in English and Spanish. You can buy them separately in my store. The script will come both highlighted for color copies, or B&W for saving ink.